Unlike Ebola, there is an effective vaccine for influenza that is widely available as fall marks the onset of the 2014-2015 flu season. “I have to remind a lot of my patients that it’s because of the vaccine that our generation hasn’t seen the kind of damage the flu can do,” UC Irvine Health Dr. Shruti Gohil says, citing deadly influenza outbreaks such as the 1918 pandemic that killed 500,000 Americans and more than 20 million people around the world. 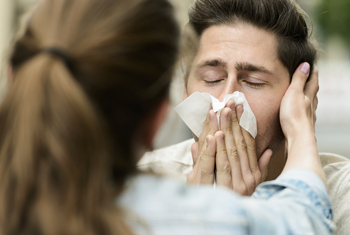 Still, each year in the United States, more than 200,000 people are hospitalized for complications of the flu, including bacterial pneumonia, dehydration and worsening of chronic health conditions. Deaths associated with this highly communicable disease ranged from 3,000 to nearly 50,000 people between 1976 and 2006, according to the U.S. Centers for Disease Control & Prevention (CDC). The risk is greatest for infants, pregnant women, the elderly and others with compromised immune systems. To protect those among us at greatest risk, Gohil says, nearly everyone – young and old – should get vaccinated as soon as possible. Getting the vaccine early in the season also gives your body a chance to build immunity before influenza cases begin to spike, usually in December, she adds. Children between the ages of 2 and 8 are particularly susceptible, Gohil says. Because their immune responses aren’t as strong as those of older children and adults, protection against the flu requires two vaccine doses, given a month apart. For the first time, the CDC this year is recommending that children receive the vaccine as a nasal spray. Gohil cites a recent study showing a 55 percent reduction in confirmed influenza cases among children who received the nasal spray. “We know that if we do a good job of vaccinating our children, hospitalizations of elderly people decrease,” Gohil says. Also new this year is a “quadrivalent vaccine,” so named because it is composed of four strains – two influenza A and two influenza B. More widely available is the trivalent vaccine, which protects against the two influenza A strains but only the most common B strain. Gohil says the trivalent vaccine offers plenty of protection. The important thing, she adds, is to get vaccinated as soon as possible rather than wait for a preferred type. A: Influenza is a contagious disease that can cause fever or chills, sore throat, muscle aches, fatigue, cough, headache and a runny or stuffy nose. But it can make some people very ill, especially those with chronic medical conditions. Flu can also cause diarrhea and seizures in children. A: Everyone 6 months and older should get vaccinated against the flu each year, with rare exceptions. These may include people with severe allergies to the vaccine or any of its ingredients, or underlying conditions such as Guillain-Barré syndrome. That’s why it’s best to get your flu vaccination from your primary care doctor, who is aware of your health history and any underlying conditions. Q: If I got the flu or the flu vaccine last year, why do I need a vaccine again this year? A: Flu vaccines are designed to protect against flu strains that experts predict will be the most common during the upcoming season, and those changes every year. A: Yes. Most people experience very few side effects, which are usually mild and go away on their own. After a flu shot, your arm may be sore for a few days. At most, you may have a slight fever, feel tired or have sore muscles. If you receive the nasal-spray vaccine, you may develop a runny nose, headache, cough or sore throat for a short time. Q: Are there different types of flu vaccines? A: Yes, there are injectable flu vaccines, most of which are made from inactivated virus strains, and nasal sprays, which are made from weakened strains that will not give you the flu. Q: Who should get the inactivated vaccine shot instead of the nasal spray? Q: Can I get the flu even if I’ve had the vaccine? A: It’s possible to get sick with the flu even if you have been vaccinated, but the symptoms are usually milder and recovery is quicker.